Classes for our upcoming programs are thought-provoking, interesting and fun. We expect students to be open minded, engaged and eager to learn about other countries and cultures. In-class instruction is enhanced with an out-of-class experience that includes escorted visits to economic organizations and leading international companies. Our courses are designed to offer students a deep insight into the European economy, society, political situation and culture. ​Classes are taught in English on-campus (and while traveling) by a faculty of multi-national and cosmopolitan professors. All majors are welcome! (international relations, economics, cultural studies, languages, political science, history, business and more). UNDERGRADUATE or GRADUATE level students are welcome to apply. In the summer program, students may take one or two courses. Two courses is highly recommended. Learn more about credit transfer. Suggested course: EUR 324 "Introduction to the European Union" This course will look quite strongly at the history of Europe, focusing heavily on events from WWII until now. The European Union recently won the Nobel Peace Prize, and has undergone the longest stretch of peaceful existence in modern history (prior to forming the EU, France and Germany fought 3 major wars over the previous 70 years). In this course, we will look closely at European history, and will attempt to bring history to life by giving you assignments to explore this history through interviewing and interacting with Europeans as we cross the continent over 7+ weeks of travel. Suggested course: COM 320 "Cross Cultural Communications": This course will look at one of the key issues in modern Psychology: that of cultural identity. During our upcoming study abroad program in Europe, students should expect to be in class in the mornings from around 9am until just after 1pm. Then there will be a break for lunch, followed by professional and cultural visits in the afternoons. 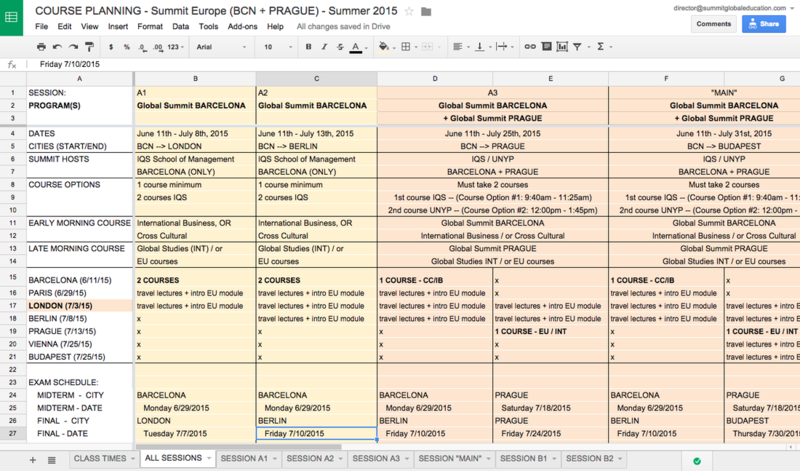 Beyond the classroom, students who come to Europe with Summit Global Education will find a full itinerary of activities. In general, you should expect to be in class in the mornings, and then we will have planned activities every other afternoon (leaving the other afternoons for personal exploration and free time). Topics covered might include current issues, social trends, culture in Europe and more. Customization welcome! Students looking to focus on specific themes while in Europe should contact Summit Global Education before going abroad.